I can't remember reading a lot of historical fiction set in Greece during WWII until last year when I read and thoroughly enjoyed Victoria Hislop's books The Thread and The Island. This year I know I have at least one more book with this setting coming my way soon, and I finished reading The Captive Sun by Irena Karafilly. 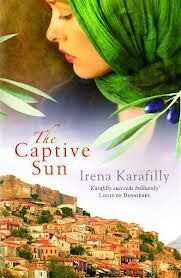 The Captive Sun was a bestseller in Greece, something which fascinates me as I often wonder how certain events are portrayed in their native countries compared to the portrayal that we get from the usual British/American perspectives! I enjoyed writing a discussion style review of the book with Lauren from Australian Bookshelf. You can read the first half of the review at Lauren's blog and the second part at my own blog!